It seems like there aren’t that many childhood TV franchises that don’t have a fighting game attached to them anymore. DC comics has Injustice. Dragon Ball Z has…Dragon Ball FighterZ. A seemingly random collection of anime characters has Jump Force. And with the announcement that Power Rangers is to get its own fighting title, I’m pretty sure it’s just He-Man, Spongebob, and the Teletubbies left until we’ve got the full collection. Power Rangers: Battle for the Grid is a fighting game featuring the titular rangers. In a trailer, which you can check out towards the bottom of this article, the Green and Red rangers do battle, temporarily aided the Yellow ranger, but sadly the Blue, Black, Pink, and White rangers are nowhere to be seen. Fortunately, however, there will be a more expansive final roster, as a press release reveals that the game will “pit new and classic Rangers and villains against each other.” I’m not sure I could name a single villain, other than the lizard thing that was so iconically portrayed by Bryan Cranston. Battle for the Grid will launch on console in April, and a PC release will follow later in the year. Cross-play between PC, Xbox One, and Nintendo Switch has been confirmed, but as can be more or less expected at this point, there’s no word on Sony’s PS4. 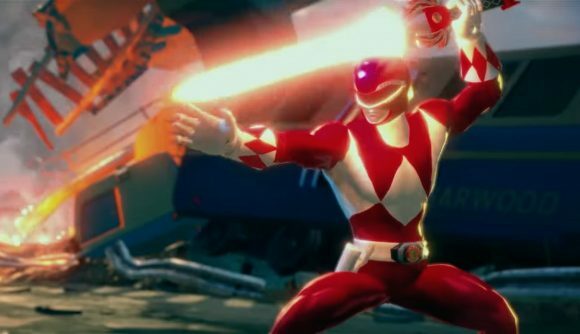 You can check out that trailer for Power Rangers: Battle for the Grid in the video below. As well as showing off some gameplay, the trailer has a brief cameo from Jason David Frank, better known as the original Green Ranger. Elsewhere in the fighting game community, a slightly less PG-13 title is also on the way – the next Mortal Kombat saw its full reveal last night. The Mortal Kombat 11 roster features the return of Scorpion and Sub-Zero, of course, as well as Baraka, Sonya Blade and new character Geras.